Swedish betting agency ATG invites members of the public to join the game, the V75 Jackpot, with a commercial featuring horses running through the Spanish city of Valladoid. 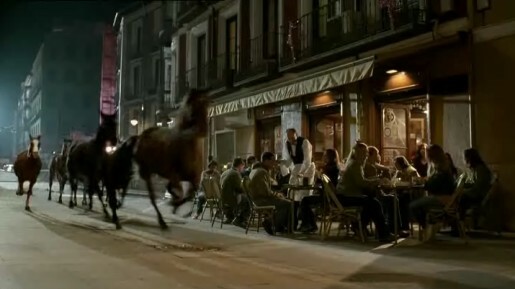 The spot opens with a woman in a store who sees the first horse out the corner of her eye. Diners, shoppers and pedestrians alike are caught up in the pursuit of the horses as they run through the streets, car parks and alley ways. Join the Game was developed at Åkestam Holst, Stockholm, by art director Jesper Holst, copywriter Mark Ardelius and agency producer Another Production Camilla Geijer. Filming was shot on location in Valladolid, Spain, by Swedish film collective Traktor, with director of photography Linus Sandgren, producers Anders Gernandt, The Producers Sweden, and Group Films Latino. Post production was done at Stopp.